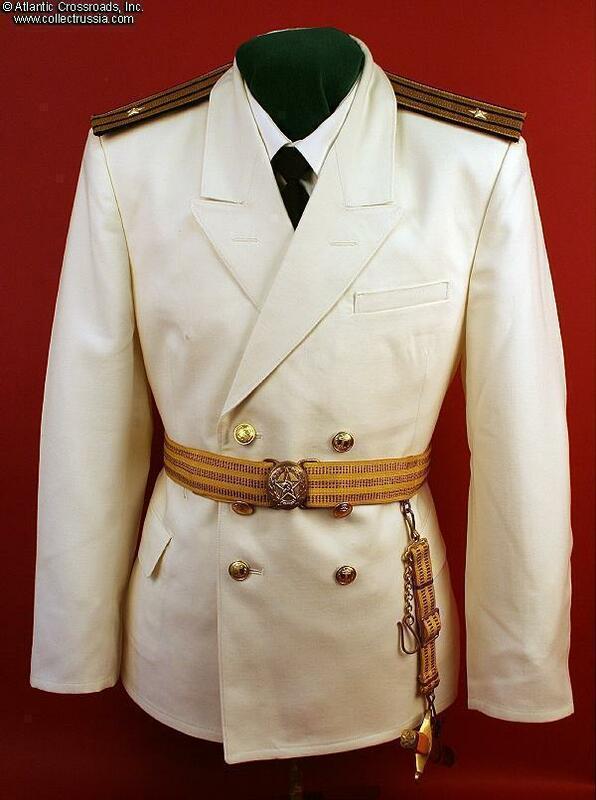 Unissued Soviet Navy "Full Dress Uniform #1, summer parade, for officers, warrant officers and extended service personnel" complete with a pair of unissued gold bullion shoulder boards. 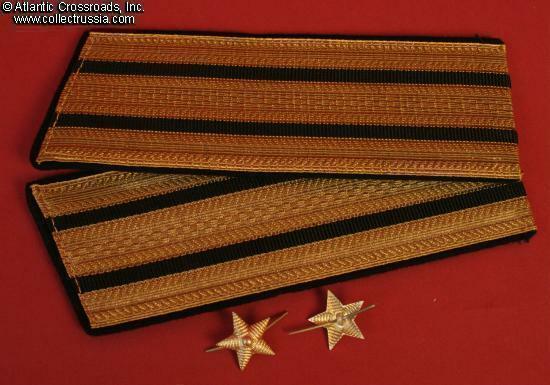 Unissued Soviet Navy "Full Dress Uniform #1, summer parade, for officers, warrant officers and extended service personnel" complete with a pair of unissued gold bullion shoulder boards. 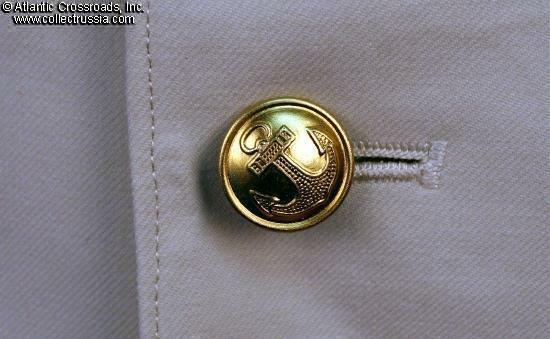 Included with the trousers and coat is a pair of gold colored stars that when mounted will make this a uniform as would have been worn by a Captain Third Rank in the navy of the USSR. Excellent condition. 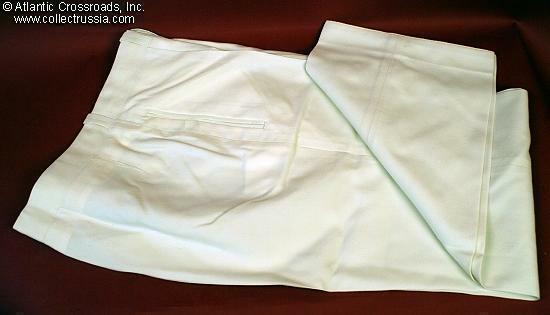 Fine, bright, white lightweight wool uniform coat and trousers. Included are an unissued pair (right from QM stores) of gold bullion shoulder boards as worn by high ranking naval officers plus a pair of gold metal rank stars. 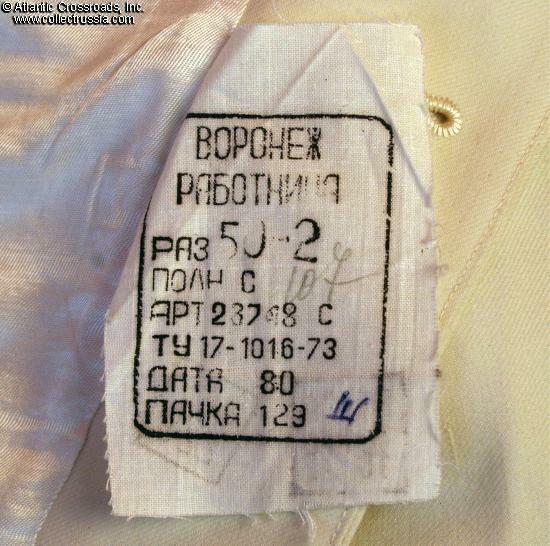 As offered, the buyer has the option of having the boards sewn on to the coat by his local tailor or we can, for an extra charge of $25.00 (and about a three day delay in delivery), have the boards sewn on for you. 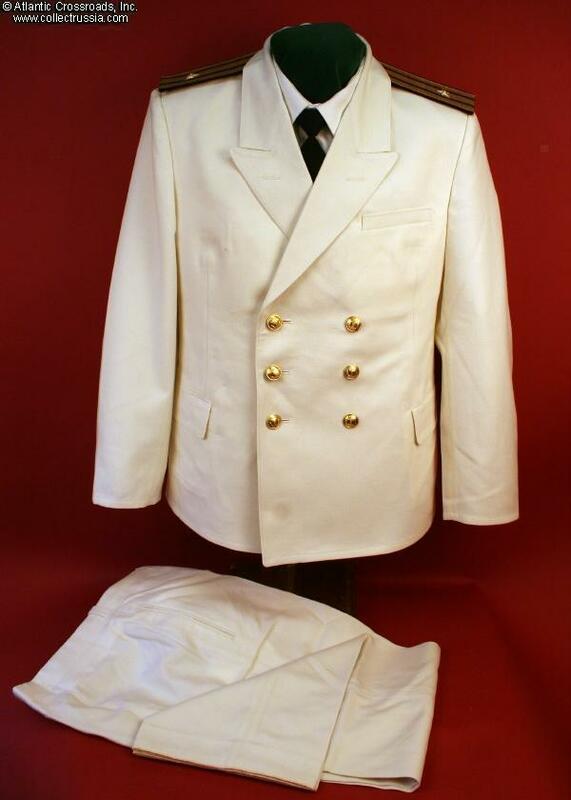 (The shirt, tie, dagger and dagger belt are not included with the coat, trousers, shoulder boards and rank insignia). The purchaser can fasten down the two stars that we are including to make a pair of Captain Third Rank boards (as shown in our photographs), or, if he has extra gold stars that he has already collected, make this uniform suitable for a Captain First or Second Rank! 46-1, (marked as a "158-92"), approximately a US coat size 36 Short. Trousers: 26" inseam, 30" waist; coat: 23" shoulder seam to cuff, 36" chest. 50-2, approximately a US coat size 42. Trousers: 27" inseam, 35"waist; coat: 23 ½" shoulder seam to cuff, 41 chest. 54-2, approximately a US coat size 44. Trousers: 28" inseam, 38" waist; coat: 24" shoulder seam to cuff, 44" chest. Please specify the size you want when you place your order. 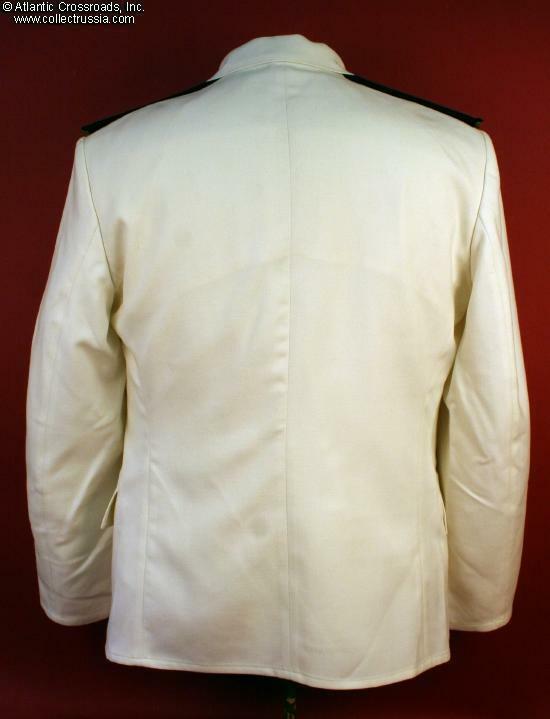 If you wish for us to have the shoulder boards sewn on for you, please make a note of that when you order.